Depression is the most common disabling illness, affecting over 300 million people worldwide . 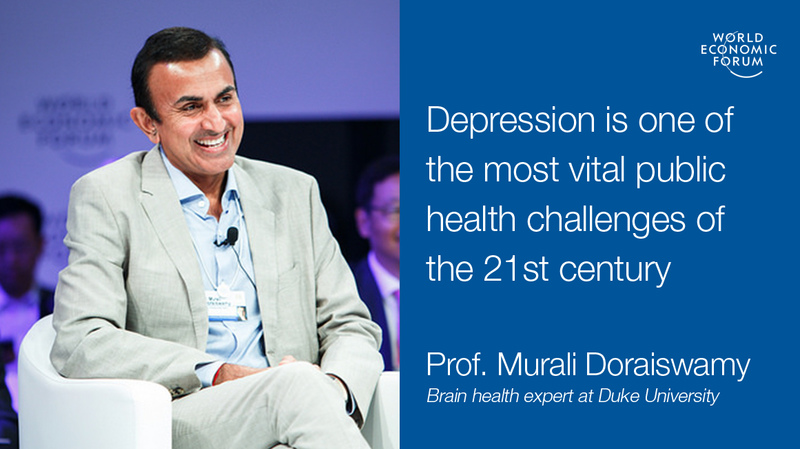 Professor Murali Doraiswamy, a brain health expert at Duke University Health System and Co-Chair of the World Economic Forum's Global Future Council on Neurotechnology, has answered questions from our Facebook audience . Important disclaimer: this is not meant to replace advice from your doctor. To me it’s one of the most vital public health challenges for the 21st century – the mind affects every aspect of our body, our physical well-being and our family and social relationships. According to the World Health Organization (WHO), a staggering 450 million people currently suffer from mental health conditions , making them one of the leading causes of poor health and loss of productivity worldwide (some 175 million years are lost to disability). Depression shortens one’s lifespan and worsens the outcome of common physical illnesses such as diabetes, stroke, heart disease and cancer. So there is really no health without mental health. I endorse many of the WHO’s mhGAP recommendations such as creating national policies and budgets for mental health, more education to reduce stigma, providing mental health services in primary health facilities, involving the community and families, making counselling and psychiatric medications more widely available, and applying technology tools such as tele-psychiatry to close gaps in access. There is a huge upside to society if we can prioritize and implement low cost, scalable public health strategies to treat and prevent these conditions. Depression is the most important value proposition in health right now. Frederick Douglass, the acclaimed social reformer, who escaped slavery, noted that “it is easier to build a strong child than it is to repair a broken man”. Ultimately, promoting an environment where people grow up resilient is the best long-term solution. The way depression manifests itself can be strongly influenced by culture, the environment and the underlying cause. For example, at the turn of the century, depression usually presented with weight loss and depressed people with weight gain were diagnosed as “atypical”. Today, symptoms of weight gain and food cravings are far more common symptoms of depression – mirroring the growth of obesity and over-eating in our society. The two core signs of depression have not changed much since Lincoln’s days and include sadness (crying spells, emptiness, loss of hope) and loss of interest in your usual hobbies or activities. Supporting features include guilt, lack of energy, sleeping too much or too little, weight changes, poor concentration, thoughts of death, and change in activity levels. Symptoms by themselves are not enough though - to be diagnosed with a major depressive episode , per DSM-5, the psychiatric bible, one must have five or more symptoms nearly every day for at least two weeks and they must disrupt your everyday functioning. Yes, they can be. Depression-related ruminations often result in insomnia and anxiety. But it also important to realize that there are many other causes for anxiety (e.g. Post-Traumatic Stress Disorder, phobias) and sleep problems (e.g. sleep apnea) besides depression. Treating depression can sometimes relieve all these associated symptoms. We don’t know the root cause yet but it is likely a combination of psychological, social and biochemical factors. Simplistic theories such as "depression is due to lack of serotonin" are false. While there is a clear biological basis, one cannot underestimate the role of mental factors . That is one reason why hearing the words “I don’t love you anymore” or “you’re fired” can lead to a complex downward spiral. Does this spiral originate in the mind or the brain? Triggers include social isolation, major life changes or stress, loss of a loved one, thyroid or B-vitamin deficiencies, brain strokes, and genetics. Because depression can present differently in different people and have different causes, it is important to seek professional help. The current thinking is that depression is distributed across networks in the brain and that different types of depression can be present in different neural networks. A recent study of more than 1,000 people using functional brain scans identified four subtypes of depression each with specific neural circuit changes. Another study called EMBARC is examining how such circuits change in relation to clinical improvements following antidepressant treatment. The NIMH Research Domain Criteria (RDoC) project is applying the latest neurosciene and genomics information to better classify depression subtypes as brain circuit problems. Ultimately, this type of information may help us better customize treatment for a given patient based on his or her unique neural circuitry. Whoever cracks the neural basis of depression in the brain will likely win a Nobel prize. The gut microbiome (the millions of bugs living in our gut) is, in many ways, our second brain. Microbes produce much of our body’s supply of mood chemicals like dopamine, GABA and serotonin, and may well influence our behavior. Treatment with Lactobacillus (the bacteria in live cultures of yogurt) reversed depressive behaviours in a mouse model and in another study , treatment with Bifidobacterium (a common bacterium) was more effective than a best-selling antidepressant at chilling out anxious mice. Pilot trials of probiotic treatment for human depression are underway and a large study called MyNewGut is mapping which gut bacteria influence brain health and stress response. Savvy entrepreneurs have also set up a national stool bank ! It’s still early days but don’t be surprised if the next time your doctor utters the phrase “Bottoms Up!” it may refer to a probiotic with “happy” bacteria. A fascinating array of brain treatments have been tried for depression over the years ranging from surgical re-section of brain regions, total sleep deprivation, fits induced by drugs like insulin or camphor, to the modern day usage of electroconvulsive therapy and transcranial magnetic therapy. Overactivity in a brain region called Brodmann Area 25 has been the focus of much recent neurological research in depression – however a clinical trial to target this hyperactivity with a deep brain stimulator failed . Additional brain stimulation trials for depression are underway. One exciting advance in the treatment field has been the discovery of a drug which can rapidly improve severe depression and suicidal thoughts - within hours or in some cases even minutes. It is not a cure, and we don’t yet know how it acts in the brain - but it works differently from existing pills offering hope it may help those who have not responded to prior treatments. A modified version of this drug , given as a squirt through the nostrils, is undergoing clinical trials to verify these claims. Pills have helped many people but they are not a cure and may not work at all for many people. We still don’t have a full understanding of how taking pills for long periods may change our brains. It is possible that some people treated with pills long-term may develop more intense flare-ups. I agree with the sentiment in your question that we need to do a better job integrating psychological and social interventions into our care models – to truly help people thrive and enjoy a full life. Depression affects both theists and atheists but initial studies do suggest prayer can be an effective treatment for depression. And there is growing evidence that spiritual lifestyle practices improve not only our psychological feelings but may also impact our genes, stress response, immunity and chromosomal biology. If you are an atheist, then try finding an activity like volunteering that gives you meaning and purpose in life or practice meditation - these can also be equally protective. Unfortunately, yes. Minor forms of depression can be cured entirely but for more severe forms, the symptoms may return in about 50-80% of people. That is why doctors often recommend continuing treatment for several months after the resolution of symptoms. Addressing risk factors for relapse such as personal stressors and negative ruminations through talk therapy, meditation or lifestyle changes can help. Studies also suggest that positive psychology activities – such as writing letters of gratitude, counting one's blessings, performing acts of kindness and meditating on positive feelings toward others – can help prevent flare-ups in response to stress. The noted venture capitalist Vinod Khosla predicts that technology will replace 80% of the time a doctor spends on decision-making , and he has funded a company developing a “smart phone phenotype” for depression based on patterns of how people use their phone. More immediate benefits of technology will be to increase access to counsellors, therapists and doctors for people living in remote areas - through smartphone video chats or messaging. There are also many new mobile apps that now allow patients to track their mood in real-time and send reports to their doctor and also do simple exercises to improve their mood or resilience. MoodGYM is a great example of an easy-to-use program. And of course, as our understanding of the brain improves, so does our ability to control it and tap into its networks to develop closed loop systems” that can both detect and treat it. Elon Musk’s new company, Neuralink, is reportedly developing a new way to hook our brains directly to the internet with hopes that such a device could in the future help treat people with depression and other disorders. As Bill Gates noted, “we always overestimate the change that will occur in the next two years and underestimate the change that will occur in the next ten.” So stay tuned. Dr Doraiswamy is Co-Chair of the Forum’s Global Future Council on Neurotechnology and Brain Science, which seeks to apply insights from behavioral and neuroscience studies to tackle some of the major problems in society.